The Macedonian capital's notoriously divisive Skopje 2014 revamp project aimed to give the city a more classical appeal. 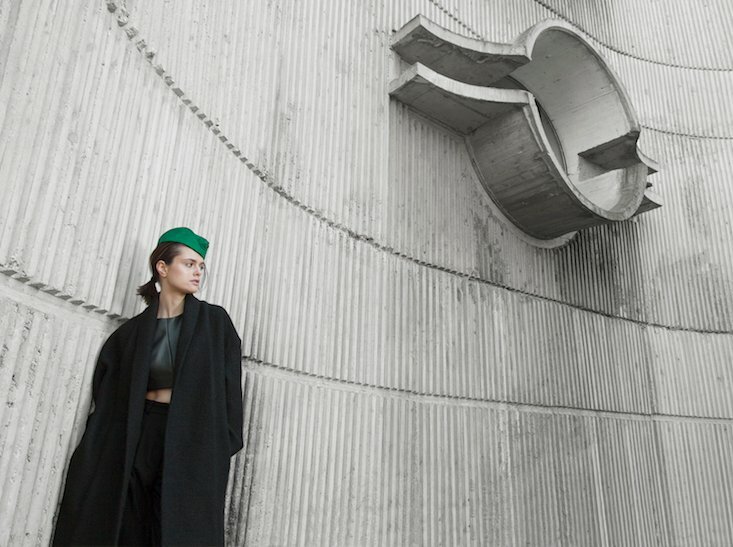 Meet Danijela Simonovska, the fashion designer who sees Skopje's brutalist architecture as anything but uninspiring. Simonovska heads up SO-USE, a consultancy service that seeks to foster the spirit of the young Yugoslav Pioneers — honest, sincerity, bravery, responsibility and respect for the environment — in Macedonia's contemporary fashion industry. SO-USE's The Future has a Past project takes its lead from both Skopje's socialist-era architecture and the Pioneer ideals: sustainable upcycled fashion inspired by the city's iconic concrete structures. In developing fresh fashion from re-worked existing pieces, The Future has a Past subtly echoes the aesthetic of these structures, imbued with a sense of being “built to last”. The project includes such innovative garments as a velvet onesie fashioned from factory leftovers and a vintage camera case strap, set against the backdrop of Skopje's brutalist architecture. Photos are by Benjamin Tafel, with the designs modelled by Martina Markovska and hair and makeup by Darko Mishovski. Find out more about SO-USE here.